as well as lease pricing. Proven on the PC Charge payment software, ChargeMax PC, permits QuickBooks users credit and debit card transactions through their preference of merchant account providers. Quickly and simply, the ChargeMax PC authorizes credit card payments within QuickBooks. No more duplicate entries of payment information into your POS system or device and then again later in order to update QuickBooks. Conveniently, ChargeMax PC incorporates standard QuickBooks sales forms (Sales Receipts, Receive Payments, and Credit Memos) ensuring that your retail data and payment authorization specifics are saved collectively in QuickBooks where they belong. Now, payments can be processed with ChargeMax PC by using any PCCharge certified merchant processor. More than 150,000 people use VeriFone's popular PCCharge software which is certified by most major payment processors and has proven to be successful over time This is good news for you if you want to continue using your current merchant account, or choose to incorporate the flexibility of choosing a different merchant account that is better suited for your business needs. Your merchant processor should be selected based on their understanding of your specific industry, rates, customer service, reporting or other important factors. Feel confident knowing that their service can be used to process payments within QuickBooks. You determine the method used to document your transactions into QuickBooks. Standard QuickBooks forms are used to record voids, returns and sales. Conveniently, you have the flexibility of immediately processing a swiped or keyed payment as you enter it or save the payment and process it along with another batch. Recurring charges may be processed as well.. ChargeMax PC enables you to accept all major credit cards, debit cards (without PIN), Level II commercial cards and purchasing cards. ChargeMax PC leverages the proven transaction processing capabilities of VeriFone's PCCharge software to handle the details of payment processing. Because of this you may now connect to your merchant processor using a modem, dial-up phone line or, for select processors, using the Internet. 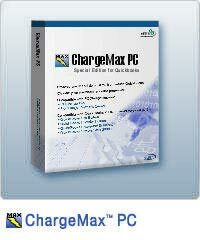 Multiple Users: ChargeMax PC may be utilized on many computers in a networked environment sharing a single instance of PCCharge running on a PC or server. Receipt Printing: As each transaction is processed the receipts may be printed from within ChargeMax PC. Improved Security: Security has been improved in all areas along with the management of sensitive credit card data and communications with PCCharge.